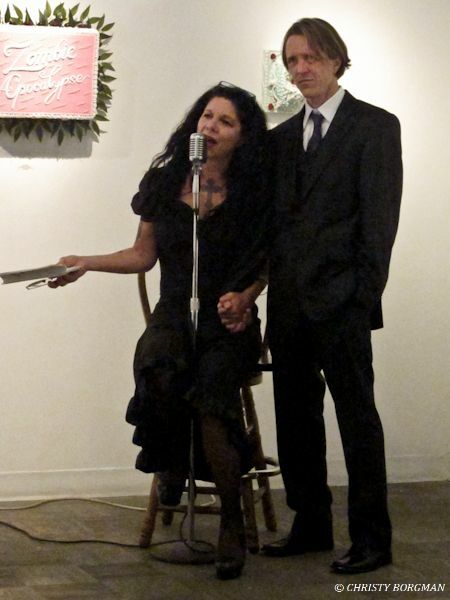 On Sunday April 22 2012, I headed to La Luz de Jesus Gallery to check out “Still In Hollywood” featuring artists Johnette Napolitano and Jason Bogart. The gallery displayed artwork from Johnette’s book, Rough Mix, along with Jason’s paintings. Johnette read excerpts from her book and delighted all in attendance by singing and adding additional anecdotes to accompany her stories. At the end of the reading, Jason came out to join Johnette in a duet of Hollywood & Vine, an unreleased song that will hopefully find a home on one of her future recordings. In the gallery, Jason’s paintings complemented Johnette’s artwork very nicely, blending old Hollywood and Rock N Roll. It consisted of a series of iconic celebrities wearing Alice Cooper inspired make-up; my favorite being a Bela Lugosi painting. I’ve been a fan of Johnette’s since the first time I heard Concrete Blonde. There is some music that you listen to. Then there is music that becomes a part of who you are. My best friend got her license and her own car before I did, and one New England summer, Concrete Blonde was a part of our soundtrack of freedom. Everything had more intensity back then and all these years later, the music still brings me back to that place. This entry was posted in art, music and tagged art gallery, Concrete Blonde, Jason Bogart, Johnette Napolitano, La Luz de Jesus, Rough Mix. Bookmark the permalink.